What I Learned This Week – 8/26/12 | I'm not stalking you. I learned that it is awesome to have an anniversary date with my husband with NO CHILD with us! We haven’t both been out together without him since before he was conceived (well, I guess the first 40 weeks don’t count). He is 21 months old…TODAY! I felt rushed, because we had to get back before he fell asleep (we failed). But we had a great time. Thanks again to LazyHippieMama for babysitting. I also learned that it is awesome to go on a family play day out together (along with our favorite little blue engine). 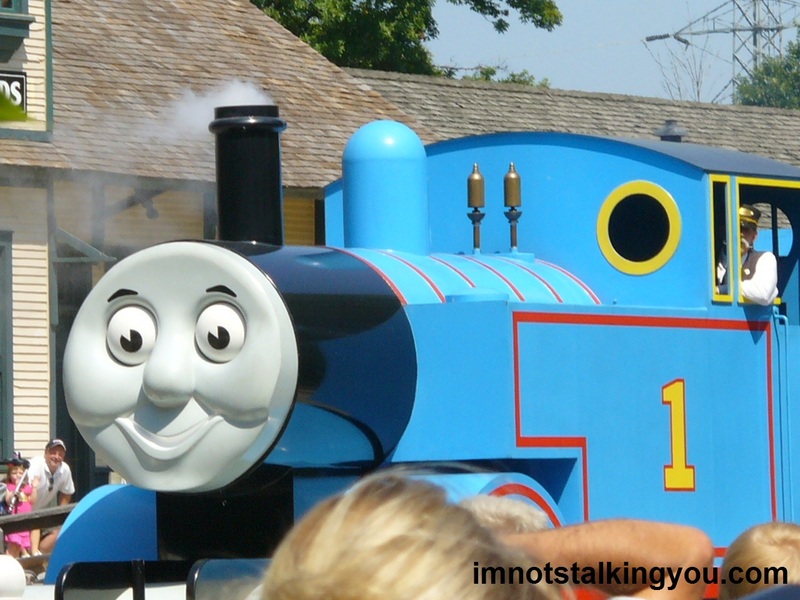 We went to Day Out With Thomas at the Crossroads Village and Huckleberry Railroad in Flint, Michigan. When I was a kid, we had a brochure in my house for Crossroads Village and Huckleberry Railroad, that we had picked up on some vacation Up North. I used to stare at that brochure and wish we could go there. How sad is that? At that time I had never been on a full-size train ride and had not been pulled by a steam engine. I have done both those things in the almost 30 years since. But, I had still never gone to Crossroads Village and Huckleberry Railroad. I sort of assumed they had gone out of business, because railroads have expensive upkeep. Then last summer a friend of mine recommended this Thomas event. I figured that my son was sort of too young to get it last year, so we didn’t go. But this year we went. And WE HAVE CREATED A MONSTER! My son can’t say “Thomas” or “train”, but he sure did say “toot-toot” a lot. I witnessed the awesome power of licensed characters and the merchandising machine first hand. But we all had great fun. And the village had lots more to do than I would have thought. We didn’t arrive til 11am, and I felt rushed. We didn’t get to see it all. When we got home, my son grabbed all his Thomas and Friends books and looked at them more carefully than before, no doubt remembering his awesome day. At least he isn’t old enough to ask for a trip to the Island of Sodor yet. Posted in A day in the life, Entertainment Worship & Review, UnProfessional Photography & Artwork and tagged babysit, children, Crossroads Village, date, Day Out with Thomas, engine, family, Flint, Friends, Huckleberry Railroad, lazyhippiemama, Michigan, railroad, tank, Thomas, train. Bookmark the permalink. Great post… really enjoyed! Brought back memories of what life was like when my little ones actually were little. Thanks for the follow. See? Told you I’d be here, funnygurl2. This is a great blog. I hope FP is in your future. Pingback: So Eager « I'm not stalking you. Pingback: I LOVE THIS PICTURE! « I'm not stalking you. Pingback: What I Learned This Week – 8/25/13 | I'm not stalking you.